So, you and that special someone want to get away huh? Just the two of you. How about a long and romantic week trip where you lounge your time away on your apartment’s private balcony, overlooking the ocean in some sleepy, little Caribbean paradise, while you sip cold drinks and swing in the hammock? 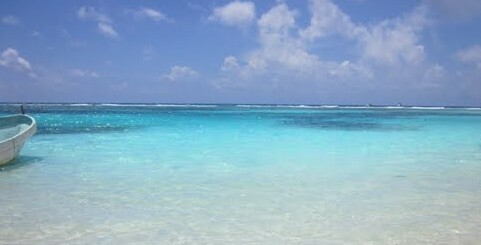 Maybe walk the few steps to take swim in the perfect, reef protected waters of Mahahual Mexico’s downtown beach. A place where you can enjoy uncrowded beaches, small boutique services and be taken care of like royalty in the process. Your own private driver for the round trip airport ride, breakfast each morning on the balcony as the sun rises over the ocean and perhaps even your own chef to prepare your meal each night, how is that for starters? Even your own private concierge, who will be there each day to make sure you get everything you need for your perfect dream vacation. If it sounds too good to be true, or should I say too expensive to be true, then think again. We now have an apartment/airport transfer, fully concierge’d packages that start at $1,200 US per week for a one bedroom ocean front apartment in Mahahual. Check this out!! The apartment is the one bedroom unit above the Tropicante restaurant, located on Mahahual’s beautiful downtown malecon and beach. This place is set up perfect for the couple wanting a little privacy, but do not want to be remote and want the conveniences of the downtown area. The huge living area/balcony overlooks the ocean and has a very intimate ambiance, with privacy walls on both sides in case you don’t feel like getting too dressed up for your morning coffee. Inside is a dining area, full kitchen, bath with shower and lots of hot water from the solar water heater, and a bedroom that walks out onto that same oceanfront balcony. Lounge in the hammock on either the balcony, or the garden area in back, if the wind is too breezy. The apartment/transfer package includes round trip, curb to curb, airport transfers that make the long 4 hour drive from the Cancun airport to Mahahual, just another fun part of the trip. Your driver will stop along the way for lunch or shopping for those last few items you forgot and we can help you plan those stops before you leave and make sure your driver knows all your plans for the ride and can make the trip perfect. Want to hit a fun beach restaurant along the way, and take a swim while they fix your lunch? No problem, we can point you toward some before you leave. If you need a modern super store stop, there are several along the way and we can help you pick the best one for what you need. As a contrast, perhaps a leg stretcher in Felipe Carrillo Puerto, about 2/3rds of the way, at the real working Maya market for a bag of fresh cut pineapple, or some home-made smoked habanero powder that you’ll find no place else and well worth the stop for that alone. The trip is four hours of driving, but if you do it right, it will take a couple hours more having some fun, and seeing some of the sights along the way, so get your flights in early and give yourself plenty of time for some fun on the way down. Having a good transport makes that trip through Quintana Roo’s cities and jungles, Mexico’s crown jewel of tourism areas, not just another long, boring ride. Far from it in fact! Once you arrive, your personal concierge will get you settled into your apartment and make sure you are comfortable and have all the info you need to get started on your dream vacation. Each day your concierge will check with you and make sure your plans are perfect for you to enjoy your day. From remote beach trips on the days the town is too crowded for you with cruise ship day visitors, to private snorkel and fishing boats, to a top certified professional masseuses who will come right to the apartment on demand, your local concierge can help you arrange it and make it perfect. In the evenings, the next day’s continental breakfast is delivered, so you can enjoy fresh local fruit, sweet breads, juices and Mexican coffee the next morning, at your leisure. Add a 5 night dinner package for $200 US, and one of our chefs will prepare your meal in the evening and serve it on your balcony, or the beach, take your pick. We’re doing it all, your way! So, if you are ready for the couples vacation of a lifetime, that private special vacation you’ve always promised each other, but never managed to take, here is the chance. Airfare to Cancun is cheap from most US and Canadian cities, and many have several flights a day. So come on, surprise someone special and lets plan your special vacation to paradise. Hit the contact us button and let us know when you are ready.